Culm Valley Young Farmers Club has celebrated the 60th anniversary of its sale and show. The event was held at Exeter Market at the Matford Centre, Exeter, on Friday April 27. The club ran classes for past member alongside the normal show, then the two supreme champions from both shows went head to head. Gilly Manley, of Windsor Farm, Hemyock, won the highest accolade of the day, winning the supreme title of the club show, then beating the overall past member winner, Helen Stoneman, from Wressing, near Kentisbeare. Gilly's beef steer, Aero, a home-bred Limousin cross, beat the other seven champions in the beef, dairy, sheep and pig sections. The reserve overall supreme champion was won by the club's dairy champion, Mark Davis from Westleigh. 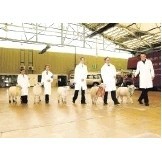 They will all now go to the Devon County Show to compete in the county championships. Sarah Spiller, a novice exhibitor from Hemyock, won both the current member pig and sheep championships. The past member sheep class was won by Carol Farley, from Uffculme, with four ewes and 10 lambs. She also won the reserve overall championship of the past member show. Graham Cligg, from Blackborough won the past member pig section. The net total raised on the day was more than £30,000, a figure which pleased club leader Jill Persey. She said: "It was absolutely great, it shows the value of the stock that was there, all of which was superb. "The fact the parents took part was part of the celebration, and made it special. There was a lovely atmosphere." YFC beef: Steer - 1Gilly Manley; 2 Chris Manley; 3 Mark Saunders. YFC Heifer - 1 Anita Williams; 2 Oliver Reed; 3 Kelly Reed. YFC Sheep - 1 Sarah Spiller; 2 Mark Saunders; 3 Mark Snell. YFC Pigs - 1 Sarah Spiller; 2 Laura Persey; 3 Laura Persey. YFC down calver heifer - 1 Mark Davis; 2 Richard Barton; 3 Becky Davis. YFC bulling heifer - 1 Robert Northam; 2 Emma Greenslade; 3 Mark Davis. YFC pet lambs - 1 Kate and Daniel Stevens; 2 Pam Quick; 3 Hannah and Jamie Stevens. Past members, beef: Steer - 1 Kevin Bishop; 2 William Sanders; 3 Sue Middleton. Past members, heifer - 1 Helen Stoneman; 2 Pam Pengelly; 3 Carol Farley. Past members, sheep - 1 Carol Farley; 2 Pam Pengelly; 3 Pam Pengelly. Past members, pigs - 1 Graham Cligg; 2 Richard Persey; 3 Graham Cligg. Past members, Dairy - 1 William Sanders; 2 Kevin Bishop.